A whopping 87 cats were brought into SCRAPS this past weekend, and another 20 came in on Monday, so the county animal protection service is hoping you want to take one home, and fast. 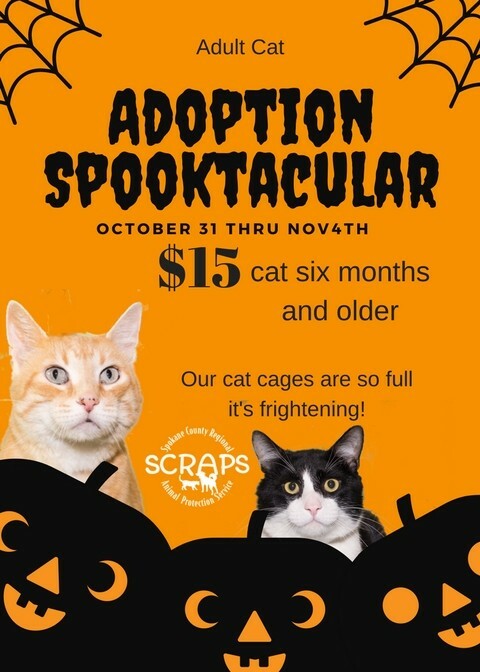 friend, they've dropped the normal adoption fee for adult cats (6 months and older) from $40 to $15 this week. That covers sterilization, licensing, a microchip, and the kitty's first round of vaccines. The "Adoption Spooktacular," which started Oct. 31, lasts until end of the day tomorrow, Saturday, Nov. 4. "We are overloaded with cats right now," says Janet Dixon, special programs manager for SCRAPS. Because their cages are overflowing, the agency had to take 30 cats to western Washington just this morning, and passed along another 30 to a local adoption partner, but their 70 kennels are still beyond capacity, Dixon says. "If anyone is even sort of looking for a cat, please come down and get one from us," Dixon says. "It makes an empty cage, so I can put another animal in it: you’re saving two lives by adopting one cat." Every year, the agency takes in more than 6,000 cats, and even though many of them belong to people, most are never reclaimed: only 3 percent of Spokane County cat owners come in to claim their lost cats, SCRAPS reports, in part because many aren't microchipped, which makes them easier to locate and return home. The shelter is considered no-kill for dogs, but for cats, the number who aren't put down is 83 percent (below the threshold to be considered "no-kill"); however, cats are only euthanized if they display extreme illness or aggression, Dixon says.